Our stroll through the MB&F M.A.D.Gallery this week propelled us into different times, in every sense of the word. From quirky time measuring devices to human scale modern pendulums, right up to French artist Renaud Marion‘s retro-futuristic vision of transportation. 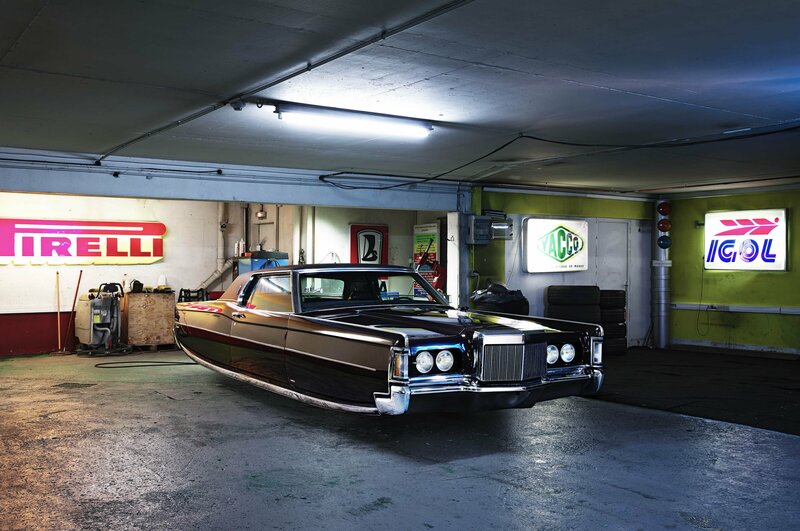 His most recent work Air Drive, a photographic series of flying cars placed in city contexts, sees wheel-less, vintage classics including Chevrolets, Mercedes, Jaguars and Aston Martins serenely levitating above the ground in different urban settings. Inspiration for the exhibition came from Renaud’s childhood imagination and sci-fi films and artists, an imagination and cinema liking he shares with Maximilian Büsser, Founder and Creator of MB&F M.A.D.Gallery. And while Marion’s dream of floating vehicles being an every-day norm has not yet materialized, the futuristic imaginings of those iconic cars looks quite attractive to us. 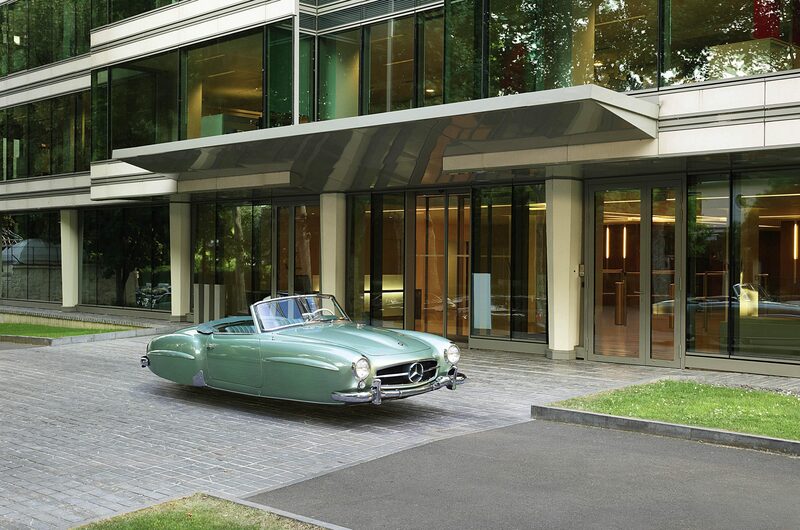 A celebration of the glory days of automobile production, seen as the future of that same industry. 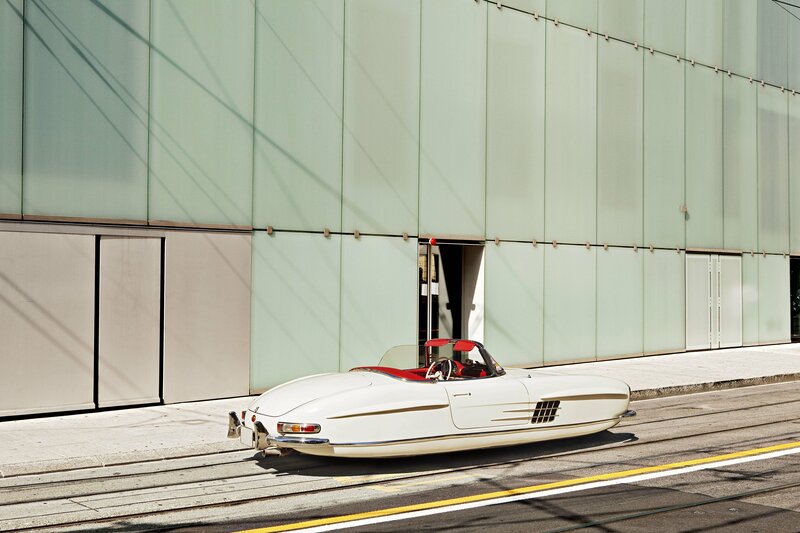 The artist developed his unique Air Drive series by first finding the subjects and locations of the shoots -he shot his first automobiles, a Chevrolet El Camino; Mercedes 300 SL Roadster and Jaguar XK120 at the end of 2012 in Geneva, with a borrowed Leica S. The second step involved the equipment. To achieve a “flying” car look, Renaud had to apply a digital assembly technique removing the tires and wheel wells from the classic beauties and merge the cars onto different backgrounds, eventually settling on the right scene for each futuristic portrayal. Casually dressed in jeans and a polo shirt, Marion is approachable and eager to talk about his art. When I ask if he had considered using contemporary cars, he explains he had tried but the effect was not there at all. “Classic cars were drawn by hand, like a piece of art; today’s cars are computer designed and most look the same. 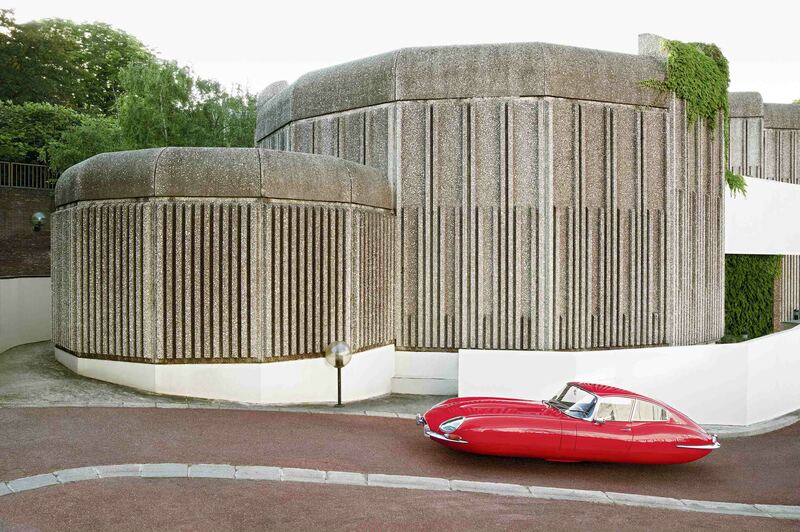 It just did not work.” Imagining a modern car hovering above the ground in front of architecture dating from the 70s such as those in the artwork, I understood his perspective. The outcome would not have been the same. From his side, Max Büsser, in a very down to earth and friendly attitude, passionately tells me about the gallery: “It is like an orphanage. We host new and upcoming artists aiming at promoting their work.” Both Renaud and Maximilian seem to share very similar passions and views of art, and it was refreshing to see such ardor towards art. Marion spoke of a project he’s working on involving “beings from the sky”; we’ll be keeping an eye out for that! Nine images in limited edition prints compose the “Air Drive” photo series, and some of the pieces are exhibited at the M.A.D.Gallery, Alserkal Avenue, until September 10.